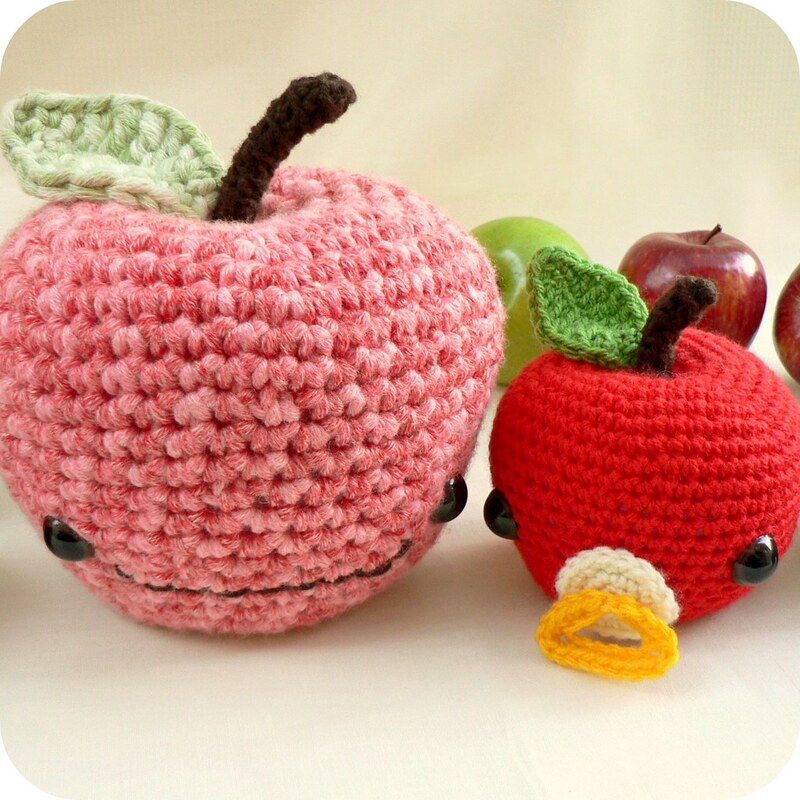 I was reading my RSS feeds and came across this blog post by Laughing Purple Goldfish. 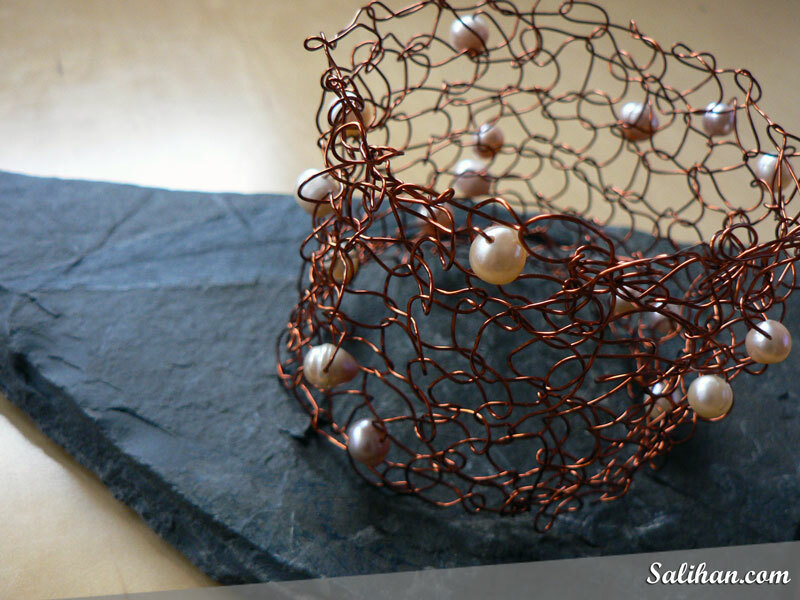 She knitted a pretty beaded wire bracelet and she made it sound so easy! I thought that I should give it a go too! I bought some inexpensive beads and 28 gauge wire. I had old knitting needles that I was willing to sacrifice for wire knitting. I had a few false starts, trying hard to loosen the way I knit. 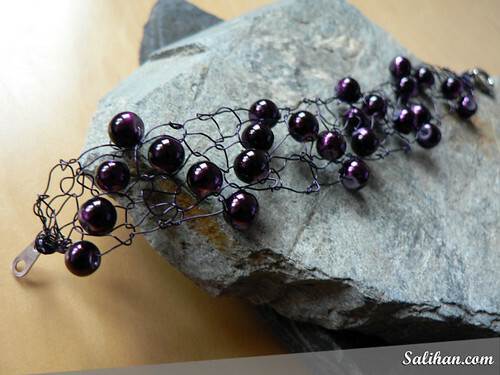 I eventually got the hang of it and produced this simple purple bracelet. 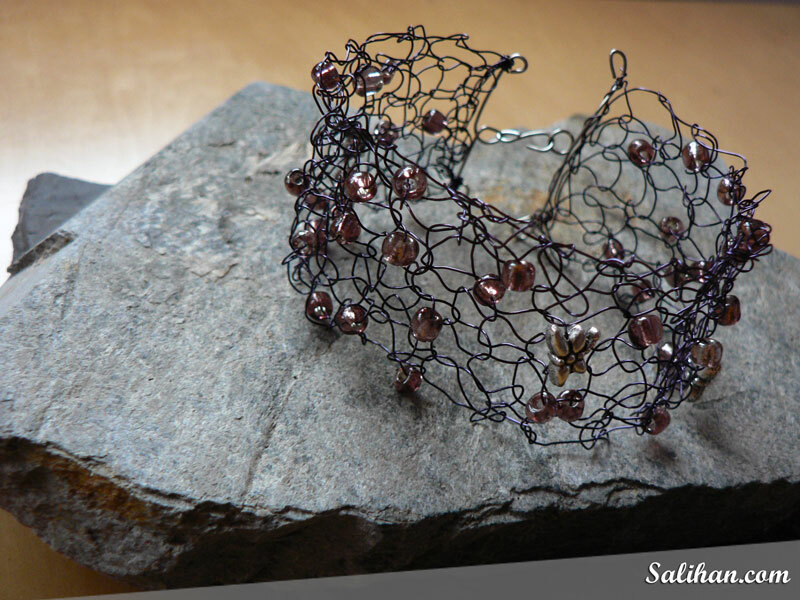 I hunted around for a way to close this bracelet off and found this knitted wire cuff. 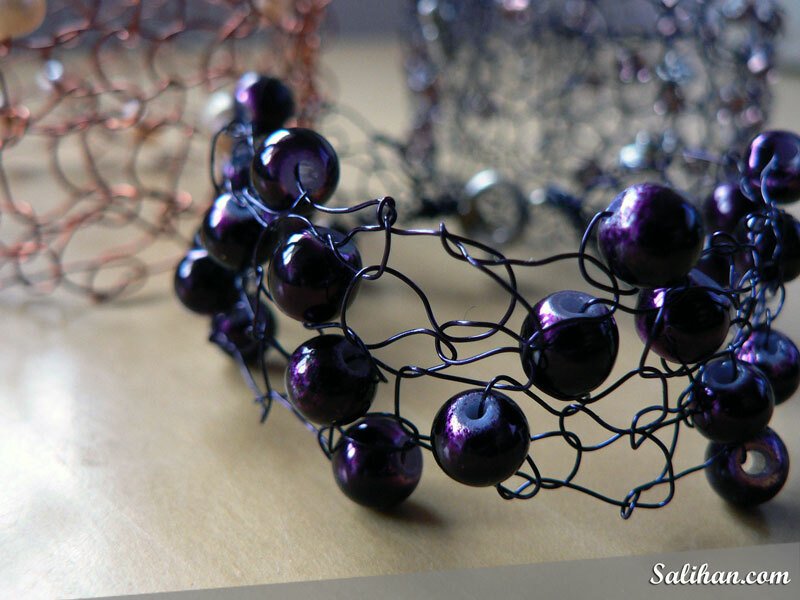 I bought thicker wire and a few basic jewellery making tools. I’ve never worked with wire before so the closure ended up a little wonky and uneven. But I can live with that. I thought to myself, “Hmm… that’s very pretty but what if the beads were not random?” So the next bracelet I planned a more structured look. The beads were all the same and placed in a simple zig zag pattern. This time I used a simple closure that I bought. Rather nice, isn’t it? Almost gothic. 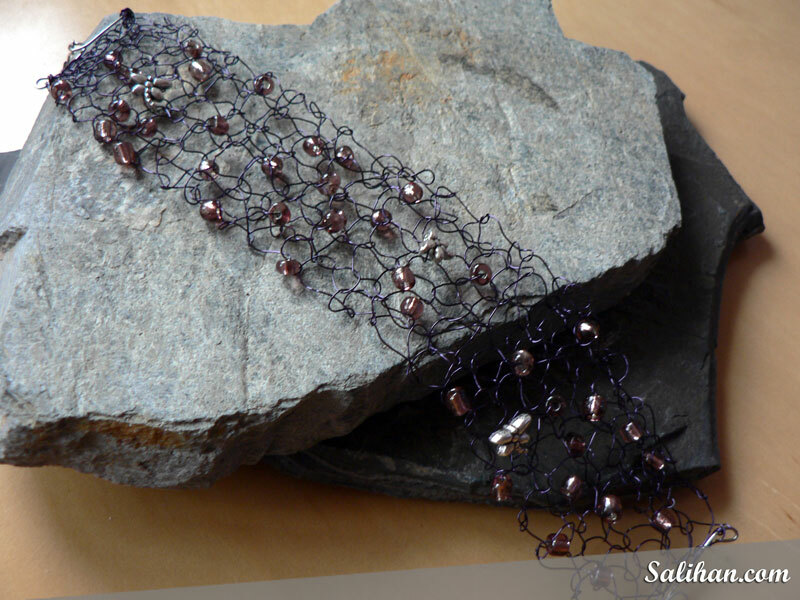 I hunted around the internet for more guidance on how to knit with wire. This website from Stitch Diva Studios was excellent! It really explained the basics in a clear, concise way for a newbie like me to understand. 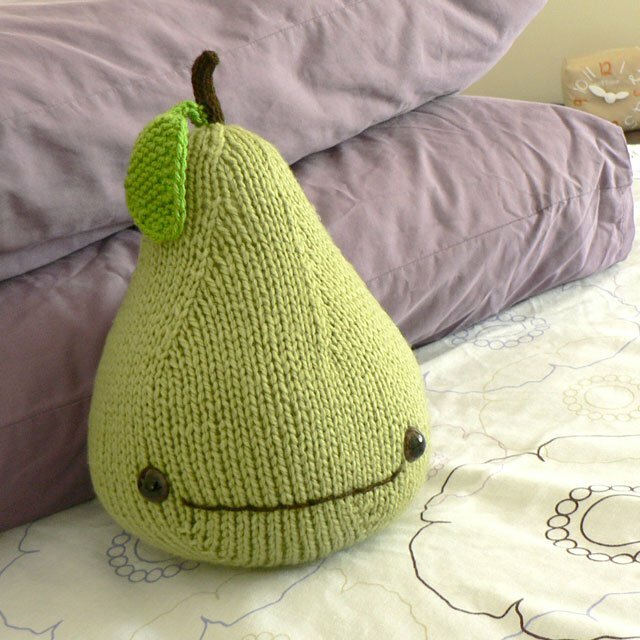 I saw this Coco Knits pattern that I really wanted to try using my new found knowledge. Off to the craft shop for more supplies and a couple of hours later, voila! Isn’t she precious! I love it! I haven’t knitted with wire since then. It really needs a clear head and a block of free time. It’s also quite hard on my wrist and elbow as wire isn’t as pliable and forgiving as wool. But I’m sure I’ll dabble with it again. Give it a go. It’s not as hard as it looks! Looks very exciting and pretty! Merry Christmas to You! Happy holidays and new year to you and your family! Very elegant piece of works. Lovely. Wow that bracelet is really beautiful- certainly worth the effort! Thanks Mel & JL! Happy holidays! Your creativity never fails to amaze me. Thanks Teresa! Thanks Umi! Have a great new year! The last one is my favourite.. so classy. that is really pretty, wonderfully done!!! .-= vanessa´s last blog ..Haakwerk-werkjes en Baileys update! =-.